Are you wondering about Cat Adoption? 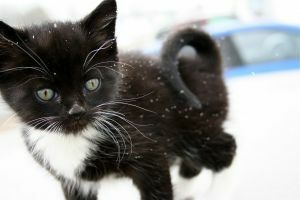 Adopting a kitten or adult cat is a great idea for the right person or household. I have always had cats and would like to share a few ideas with you on how to adopt a cat. It is important that you take your time in deciding to adopt any pet. Please be sure that Cat adoption is right for you! Where Can You Adopt A Cat? Do not be afraid to check your local humane society out. Adopting from an animal shelter is a wonderful idea – you will likely be saving a life. Many Cats end up in shelters for reasons that are not their fault. Usually it is simply because people do not spay or neuter their pets and the cat population grows too fast. Sometimes it is because of a change in the owners life (having to move, new job, illness, etc.). All in all a cat from a shelter will have been well cared for and simply needs a good home. Cat Rescue is another great idea for cat adoption. Animal shelters are often over flowing and as a result cat rescue groups take on the extra cats. Adopting a rescue cat keeps them out of shelters that have policies to euthanize unwanted cats. Cats found in a rescue will be especially well cared for. This is because rescue groups are run by volunteers who are very passionate about their furry foster kids. I have worked in Pet stores for many years but I can’t claim to know this part of the business inside and out. A common concern about pet stores is that the kittens are not well bred. I do feel that their living conditions and care in a pet store is not as good as in a rescue. Cat Breeders are very passionate about their cats and are passionate about cats. Most often they get into the breeding business for the love of cats, not money. Of course, there are some that are just in it for the money. You’ll be able to tell them apart right away. If you want a pure bred cat this may be the way to go. You can meet with the cat breeder to discuss if the breed of cat is best for you. You might be surprised to learn that many pets found in shelters or rescues are pure bred. Just without their papers in many cases. Word of MouthThere never seems to be a shortage of cats up for adoption. Keep your eyes open and I am sure you will see a newspaper ad, a sign on a street pole or bulletin board ad offering a free kitten. What To Do When Adopting a cat? How Much Does Cat Adoption Cost? Adopting from a shelter or animal rescue may cost a couple of hundred dollars. This is especially true if the shelter takes care of medical procedures (i.e. spay and neutering) ahead of time. Beyond this there will still be veterinary bills plus the cost of food and other supplies. Adopting from a Breeder could cost several hundred to a thousand dollars – depending on the popularity or rarity of the breed. Should I Adopt a Certain Cat Breed? Your new furry friend will demand a lot of attention at first. Especially if it is a kitten. Make sure you prepare the house so there are no hazards for your new cat. Oh, and remember that you are making a 15 year decision here! Good luck with adopting a cat!